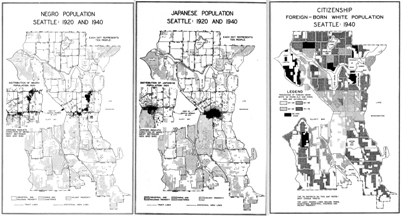 Here are interactive maps showing the residential distribution of African Americans, Asian Americans, Native Americans, and several other ethnic groups in Seattle, Tacoma, and Spokane decade by decade from 1940 to 2010. This interactive map shows the location of a selection of most of the Civilian Conservation Corps camps established in Washington State between 1933 and 1939. Click to see this map and accompanying photos and descriptions of each site. This interactive map shows the locations and photos of federally funded public works projects in King County in 1933 and 1934. Included are construction projects, food and clothing banks, park and landscaping work. Click to see this map and accompanying photos and descriptions of each site.